A large part of the information needs in everyday settings is directly related to real-world entities, like objects, places, and people. Attaching information to those entities thus has many benefits for the quality of interaction between humans and their environment. For example, an object could provide users with its own object-history, which could be used to infer object relationships and interaction contexts in which the physical artifact has taken part. By connecting physical artifacts to information in the virtual world, such "physical hyperlinks" can serve as visible entry points into the information infrastructure, thus increasing accessibility and visibility of a virtual environment from within the physical world. Narrowing the gap between the physical world surrounding the user and the virtual world requires a kind of "bridge" between entities in the real world and the associated information in the virtual world. Interaction with the virtual aspects of an entity requires a device which is able to detect the entity and display related information. Such a "symbolic magnifying glass" allows, for example, to make object relations visible, to access virtual functions of an object, and to virtually zoom into and out of an object in order to get to know the object details or the object's context, respectively. Physical objects thus become "interactive" in a way which formerly was only possible with purely virtual, computer-based objects. Demo: Solfège Hand Sign Recognition with Smart Glasses. Demo: Mobile Augmented Reality for Dentistry: Virtual Try-On in Live 3D. Focus: Robust Visual Codes for Everyone. Wearable Barcode Scanning: Advancements in Visual Code Localization, Motion Blur Compensation, and Gesture Control. Fast Blur Removal for Wearable QR Code Scanners. Multiframe Visual-Inertial Blur Estimation and Removal for Unmodified Smartphones. Demo: Estimation of 3D Hand Position and Gestures on Unmodified Wearable Devices. Joint Estimation of 3D Hand Position and Gestures from Monocular Video for Mobile Interaction. In-air Gestures Around Unmodified Mobile Devices. Demo: In-air Gestures Around Unmodified Mobile Devices. GPU-Accelerated Joint 1D and 2D Barcode Localization on Smartphones. Blur-Resistant Joint 1D and 2D Barcode Localization for Smartphones. Cyclo - A Personal Bike Coach Through the Glass. Poster: Device Recognition for Intuitive Interaction with the Web of Things. Demo: Uncovering Device Whispers in Smart Homes. Poster: Towards Next Generation Barcode Scanning. Augmented Visualization with Natural Feature Tracking. An efficient bar code recognition engine for enabling mobile services. An Evaluation of 1D Barcode Scanning on Mobile Phones. Influence of User Perception, Security Needs, and Social Factors on Device Pairing Method Choices. SPARK Rapid Prototyping Environment – Mobile Phone Development Made Easy. Encountering SenseCam: Personal Recording Technologies in Everyday Life. An Evaluation of Product Identification Techniques for Mobile Phones. On the Use of Sensor Nodes and Mobile Phones for the Assessment of Noise Pollution Levels in Urban Environments. BaToo - Enabling the Rapid Prototyping of Mobile Services to Retail Products. 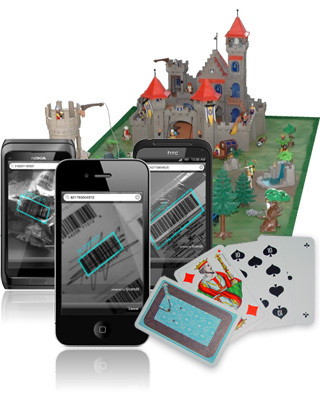 Rapid Prototyping Platform for Mobile Phone Based Services on Retail Products. Facet: Towards a Smart Camera Network of Mobile Phones. Koubachi: A Mobile Phone Widget to enable Affective Communication with Indoor Plants. Operating Appliances with Mobile Phones – Strengths and Limits of a Universal Interaction Device. Objects Calling Home: Locating Objects Using Mobile Phones. Mobile Phone Based Interaction with Everyday Products - On the Go.